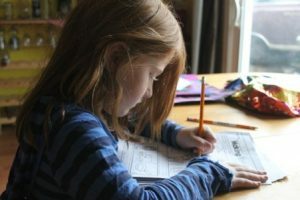 Trawling through a mountain of your child’s homework can be difficult for both of you, especially when it starts becoming a bit more complicated. But, with a survey showing that only 11% of UK parents spend 7 hours or more a week helping their kids with homework (Varkey Foundation), it’s clear that many of us can be doing more to encourage our little one’s learning. Whether you take the time to sit down and help them the traditional way, try to make it more fun and interactive, or praise and reward them for good work, there are many ways you can get more hands-on with their homework. Here, we will be sharing some of our top tips for doing so. Although it might sound tedious, a homework plan can be a great way to get your kids on top of their school work. To make sure you’re scheduling time in for all subjects, you should have a copy of their timetable to base their homework schedule on. Even if they don’t get work to take home from all of their daily lessons, you’ll still have time planned in in case they do. When creating this plan, it’ll be a good idea to break the work periods up into chunks. This can involve figuring out whether it’s best for them to do the bulk of it before or after dinner, as well as being sure to make a note of any extra-curricular activities they have on certain days. We would recommend them doing each piece of homework for half an hour at a time, and then having a 10-minute break to rest before going onto the next subject — just be sure to stick with around 2-3 subjects per night maximum. When there are distractions all around, it can be difficult for your kids to concentrate. With this in mind, it’ll be a good idea to create a designated study area that makes them willing and ready to get their heads down. This might be something as simple as making them do their homework at the kitchen table where you can supervise while making dinner. Alternatively, you might choose to create their own study carrel so their homework spot mimics their classroom environment. All you have to do is use some cardboard to create a booth that can then be decorated with their timetable, and other useful resources that can be swapped daily. For older children, it might be good to add a private desk in their bedrooms to give them some independence over their own learning. We all know how difficult it can be to get your kids to sit down and focus on their homework. But, in today’s digital society, there are plenty of online interactive resources that you can use to make learning fun for your kids. Educational game and activities site, Busy Things, has a specific section for family learningto make the experience more fun and engaging. And, as all the content is directly linked to the curriculum covered in schools and can be tailored to your child, you can be sure that what they’ll be learning is relevant and useful. They’re sure to love any excuse to get onto the computer so do make use of online tools! Praise and congratulations are very effective ways to encourage good behaviour (a technique also known as positive reinforcement), so make sure you’re outwardly rewarding your child for the good work they do while at home. To do this, you could create a gold star chart, or get one free off the internet likethese onesfrom RewardCharts4 Kids.com. These can highly motivate your kids to do their work, especially if the gold stars eventually amount to a small treat such as a packet of sweets or a magazine from the newsagents. A great way to help your kids with their homework is to make use of educational decorations. This is a particularly useful tool for teaching them key subjects, such as where all the countries in the world are on a map, or their times tables. You could even decorate the walls of their study carrel or the room where they do their work with educational decals like these ones from Icon Wall Stickers, to get them well familiarised with the basics. You could get your kids to help you pick and apply these decorations for a truly interactive experience. Getting your child to sit down and do their homework can be difficult. But, with my top five tips, a spare hour or two per night and some persistence, you can help to make learning fun for them.